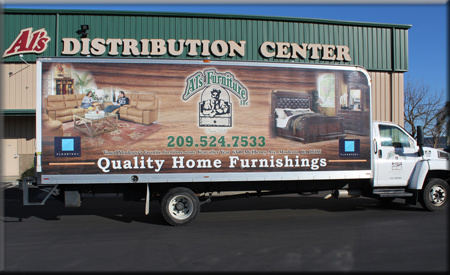 Al’s Furniture has a large selection of accent furniture to complement your home’s decor. Whether you are looking for a small book shelf, a credenza, a cabinet, a cupboard, a chest or an accent table, you are sure find accent furniture to suit your taste at Al’s Furniture Showroom. We strive to keep our website up to date so that what you see here is what we have in stock, and ready for delivery. However, when you see something you want, we don’t mind at all if you want to check availability, just call us at (209) 524-7533. Click on any of these images for a larger view. Four windowpane detailed glass fronted doors run the length of our media console, revealing a multitude of shelves ready to hold your entertainment equipment. Finished in our Candid Blue, the expansive top is ideal for your large flat screen, and with an inner wire management system, cords will be neatly concealed and out of your way! Make a statement with this eye-catching, textured blue, black, or red credenza. The beautiful geometric-shaped Chinese Chippendale fret work overlay allows a peek into the four doors. Simple moldings accentuate the horizontal shape and the ornate door pulls add even more detail to the doors. This accent credenza could be used for extra storage or as a media cabinet. The Earlyville 3 Drawer Chest will create a focal point in any room. Resting on four simple and straight legs, the three drawers are highlighted by oversized and highly detailed butterfly-shaped pulls. This unique hardware creates a striking contrast with the Earlyville Brown finish. Rustic and bold, the Hylas Etagere has the natural charm of reclaimed wood. Finished in a warm and neutral Hylas Medium Brown, it has a slab top, balanced with a slab-style base, both with beveled edges. Four shelves provide plenty of storage or display space. Iron legs and accents offer an industrial feel as well as support. This stunning Idlewilde media credenza is functional and attention getting. The vibrant Idlewilde Red finish is tempered by a darker applied stain, which adds interest and depth. The four glass doors are enhanced with a metal lattice pattern and decorative hardware, providing charming details. There are three compartments inside, each divided by a shelf. Pair the Quails Run 84" Dining Table & Rake Back Chairs with the Quails Run Sideboard Server for a complete set. It is neutral enough to blend in any space, but you will want this beautiful Jenkins Four Drawer Chest front and center. An Ivory base is the backdrop for the four drawers and the sides, which are finished in Jenkins Grey. What distinguishes this chest from all others is the lovely hand-painted leaf and vine design and all its intricate details. This chest also has beautiful Crystal like drawer pulls that are a striking accent. The Leslie Cabinet will inspire fun and games with its whimsical shapes and lively colors. Each of the nine drawers has its own unique shape and texture. The multi-color finish is a delightful touch. Ornate hardware, a decorative skirt and carved legs all add even more personality.